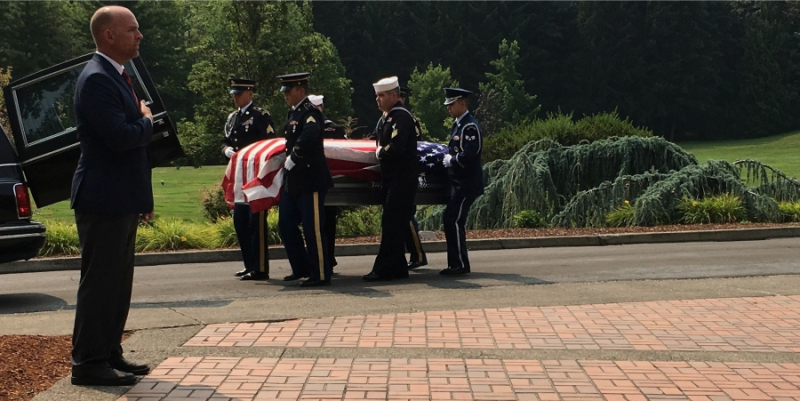 James C. Wersick passed peacefully after a brief illness August 2, 2018, at Salem, Oregon, where he lived after leaving Greenbelt, Maryland, in 2016. Jim was born August 31, 1924, in El Paso, Texas, the fourth of five children of Rose Ann MacCambridge Wersick and William Karl Wersick. Sisters Betty, Rose, and brother William preceded Jim, and sister Frances followed. While he was still a small child the family was transferred to Honolulu, Hawaii; father William was career Army. Jim recalled Waikiki Beach, bouncing on the knee of a German sailor in those pre-war days. By the time he was ready for school, father was transferred to War Department duty in Washington. The family found a permanent home in Mt. Rainier, just across the District of Columbia line in Prince Georges County, Maryland. The family was close and pulled together through the Great Depression, buoyed by their faith as dedicated members of St. James Catholic Church in Mt. Rainier. Jim’s formal education ended in the ninth grade, when he left to work full-time to contribute to the family. Jim joined the Army in 1942 and served in the South Pacific. He was part of an early wave landing on the Okinawa beaches and was awarded a Purple Heart for wounds suffered on Leyte. After the war Jim found work as a lineman for the power company. He soon moved to the Chesapeake & Potomac Telephone Co., where his hard work took him from lineman to cable splicer to foreman to middle management wearing a suit at headquarters in Washington. 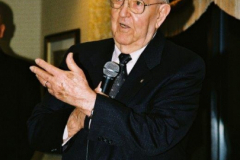 He retired from the successor companies, AT&T and Verizon, in 1982. Settling in Greenbelt about 1950, Jim was one of the first members of American Legion Post 136. 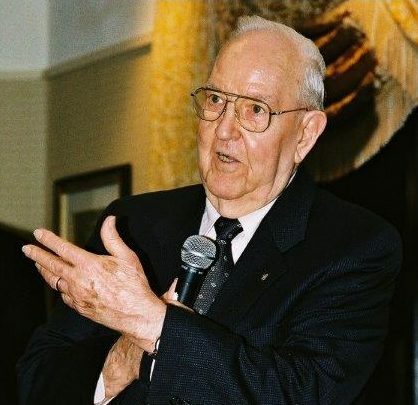 He was proud to serve as Post Commander in 1986–87. 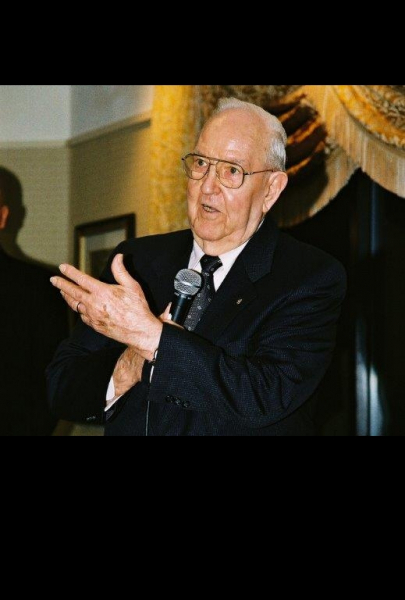 Jim was a patriot and lifelong devoted his energy to “the Legion” and the well-being of veterans. His fellow members knew he worked for the post as diligently as he did in his regular job and expected the same from them. He remained active at the Legion in various roles well into his eighties. He was a lifelong season ticket holder for the Washington Redskins. In 1962 Jim married Margaret Manton Yunker. Daughter Candice Elyse arrived in 1966. Always active, Jim earned extra cash in retirement painting and papering throughout the Washington metropolitan area with his childhood friend Jim Wells. A meticulous craftsman, he was generous with his skills. He beautified the homes of many of his extended family and friends with his work until he was nearly 80. Jim was devoted to Marge for 53 years, and nursed her through extended illnesses until she passed in 2015. He grieved Marge deeply. 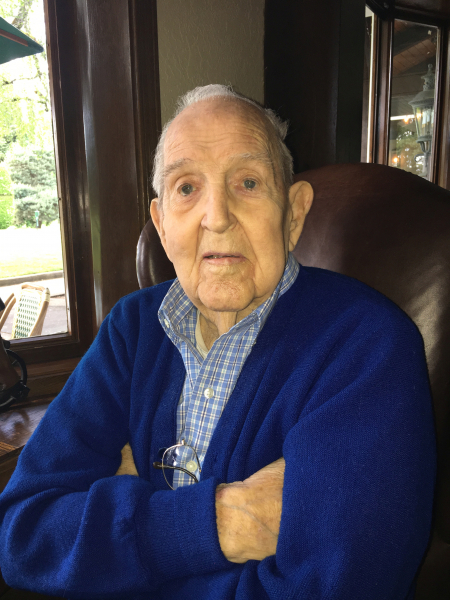 Always healthy, within a year at age 91 he developed congestive heart failure—literally dying of a broken heart. Needing care, he sold the Greenbelt home where he and Marge had lived for 48 years and moved to Salem to live with his stepson, Conrad Yunker, and daughter-in-law, Mary. Jim found excellent medical care in Oregon. His health improved, he received a new hip, and eventually he moved to his own apartment. 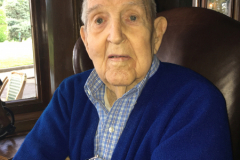 He passed his time watching golf and baseball and cursing the Orioles; talking with friends, nieces, and nephews by telephone, and enjoying dinners and outings with Mary and Conrad. He is survived by Candice Elyse Paulus of Hanover, Pennsylvania; Conrad and Mary Yunker, and numerous nieces and nephews from Massachusetts to Florida to Michigan, all of whom loved him. 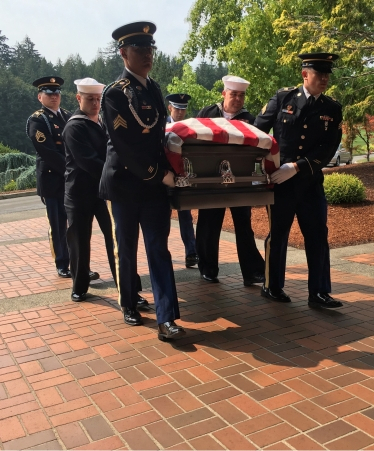 Interment with full military honors was August 16, 2018, at Willamette National Cemetery in Portland, Oregon. As he wished, Marge’s ashes were placed with him. 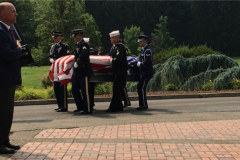 Today Jim was laid to rest beneath the noon sunshine, to join fellow heroes at a beautiful hilltop glen. 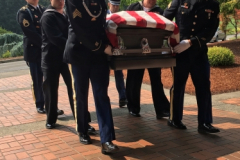 The family was grateful for the precision and attention paid by the six anonymous, uniformed soldiers and sailors of the honor guard. The family appreciates the compliments and condolences offered by so many who knew Jim. He will be missed. It has been an honor to serve such an amazing man. Thank you for trusting Johnson Funeral Home.